One of the easiest ways to add some comfort and joy to your holidays is with natural aromatherapy products. While for some, a fir or pine tree might take center stage, wafting a crisp, green aroma throughout the home. Others might prefer to display fresh cinnamon brooms around the house or spice-filled candles, like clove and nutmeg. But, if you’re someone who’s not so into decorating or who maybe is going minimalist this year (or have someone on your gift list! )—then an aromatic spray can help you do more with less. Aromatic, essential oil room sprays are really simple to make at home. They only require a few ingredients, and you can customize them to your favorite scents. Let’s face it … the room spray aisle at the local supermarket can be overwhelming. The products have delicious names that can leave you salivating in the aisle, but when you actually spray them … bleh. A synthetic “pine” comes out that smells more like a mix of toilet cleaner and car freshener than a fresh forest. And it’s better to inhale the “real deal” than a cocktail of lab-cooked chemicals, right? So, this year, make your own aromatherapy spray with organic or wildcrafted essential oils. We tell you how below. It’s a quick, fun way to get a room freshener that makes you feel good and is good for you! Plus, it can double as a body spray, so if you get it on your skin, you don’t have to go running to the sink in a panic! And, they make great gifts because they’re both crafty and personal (and relatively inexpensive!). The first step to making your own aromatherapy room sprays is to prepare an aroma concentrate (essential oil blend). We’ve included several recommended blends below. Think about the overall feel you’re going for. Do you want an aroma that’s light and just barely reminiscent of vanilla cookies or do you want an aroma that smells like you’re submerged in a giant bottle of allspice? Or, maybe you want something in-between. We have some quick tips on aromatic blending here. Add 10 drops of your essential oil blend to 2 teaspoons of alcohol, Everclear, or vodka. Blend together in a bottle and shake well. 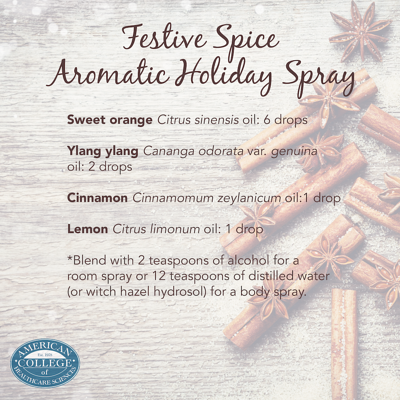 Body sprays are often subtler than room sprays because, well, most people don’t want to walk around smelling like they bathed in Christmas tree. So, when you’re making your aroma concentrate or essential oil blend, think about the aromas that typically smell good on your skin and / or the aromas that make you feel a way you like. For example, jasmine is commonly used in perfumes because it is associated with romance and attraction. Remember, eucalyptus may smell heavenly in a wreath on your door or do an amazing job tidying up your gym bag. But, you likely don’t want to wear it’s characteristic, somewhat medicinal aroma around on your clothes. Add 60 drops of your essential oil blend to two ounces of distilled water or witch hazel hydrosol. Blend together in a bottle and shake well. Spray upward into the air and walk underneath. If the aroma is not strong enough, add more concentrate in 5-drop increments and test again. Since it ’tis the season to embrace warming, sweet, and savory aromas, we’ve put together some aromatic inspiration for your blends. And remember, always use organic or sustainably wildcrafted essential oils when making natural skincare, wellness, household, and beauty products! Not only does this support your optimal health, it protects the well-being of the environment and our natural resources for generations to come. *Blend with 2 teaspoons of alcohol for a room spray or 12 teaspoons of distilled water (or witch hazel hydrosol) for a body spray. Ready to amp up your DIY passion and start making natural products at the professional level? You can earn your Certificate in Natural Products Manufacturing (CNPM) with ACHS! You’ll learn how to use herbs and essential oils to create handcrafted and natural beauty products, lotions, salves, creams, body sprays and perfume blends with essential oils, bath and bodycare products, and so much more.